Vidimus wishes all its readers a HAPPY CHRISTMAS. This issue brings news of recently cleaned glass at Michelmersh in Hampshire, and the second part of our history of the York Glaziers Trust – the dramatic fire of 1984. There is also a Christmas bonus feature: a Christmas ghost story by the English author M. R. James, formerly Provost of King’s College Cambridge. Central to the story is the glazing of Steinfeld Abbey. Read on … perhaps by candlelight! 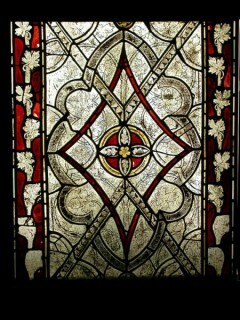 The glass at King’s College is also the subject of a new book featured in our News section.